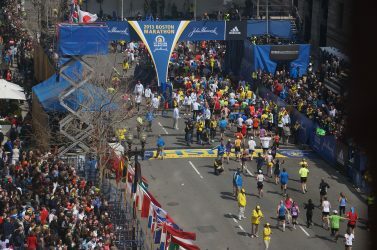 On April 15th, 2013 the city of Boston and the nation were rocked when radical Islamics Tamerlan and Dzhokhar Tsarnaev exploded two bombs near the finish line of The Boston Marathon. Patriots Day was a gripping film that focused on the people affected by this heinous act, and the fervent police and FBI investigation in identifying and capturing these terrorists. Once again, Mark Wahlberg and Peter Berg teamed up as they did 6 months ago in Deepwater Horizon, a dramatization of the worst oil spill in history. Patriots Day gave us a much more personal glimpse of a different kind of tragedy. 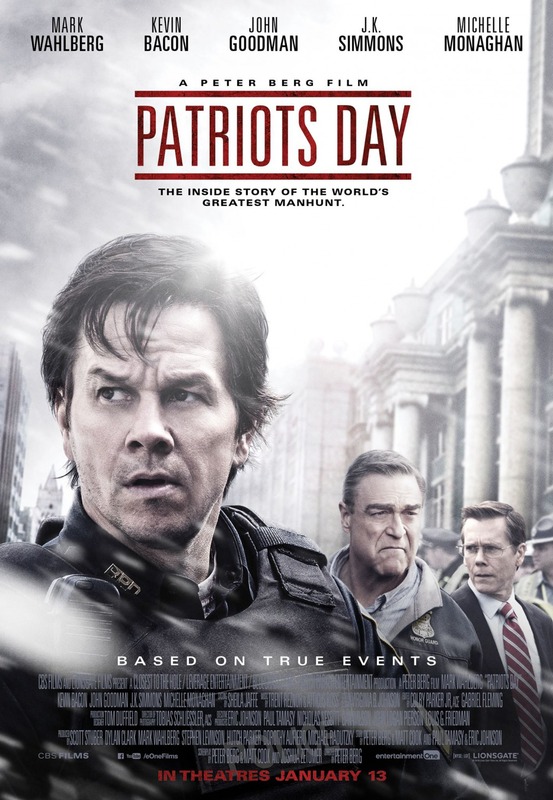 Patriots Days was a docu-drama that starred the fictitious composite character of Sgt. Tommy Saunders (Mark Wahlberg), who we immediately identified as a tough, Dirty Harry type cop. Saunders was just coming off of suspension, so this Police Sergeant was relegated to some donkey work of crowd control at the Marathon because of this suspension. He was on the front line when the explosions hit, and along with other first-responders had to deal with the grisly task of immediate attention to the maimed and killed, as well as trying to restore some sort of order amid the terrible carnage and chaos. 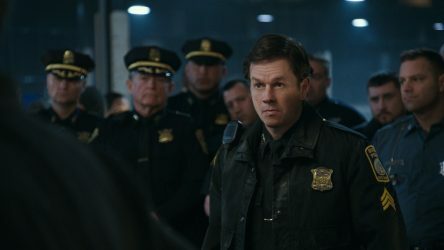 Mark Wahlberg was the star, with another fine performance that included one especially emotional scene. Kevin Bacon was the FBI Special Agent in charge of the investigation and his tense interaction with politicians and local law enforcement was quite convincing. The always dependable and venerable J.K. Simmons shined in his role as small-town Watertown Police Chief, especially in the confrontation with the terrorists. The great John Goodman was wasted (again) in his almost cameo role, and the only thing memorable about his part was the audience observation about how much weight he had lost. The other 3 standouts, Alex Wolfe, Themo Melikidze and Jimmy O. Yang will be discussed later in the review. One thing Patriots Day did very well was the character development and near-impossible humanization of the two kids who perpetrated this bloody outrage. 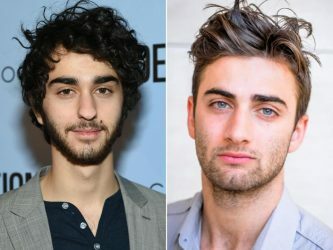 Tamerlan and Dzhokhar Tsarnaev (Alex Wolfe and Themo Melikidze) were these sub-humans, and we never know exactly why they commited this crime, but we were given in-depth insight into their characters. Tamerlan was the big brother and leader of this tandem of terror and really looked the part. He was in a word, terrifying. Dzhokhar was more of a goofy college kid, playing video games and texting, but he was fiercely loyal to his brother’s terrorist passions. Melissa Benoist, who played Tamerlan’s wife was magnificent as she portrayed the very embodiment of the subservient Islamic wife who did not even flinch, even under intense interrogation. Patriots Day gave us a glimpse of the Tsarnaev family, which included wife and child and scenes where they were nonchalantly sitting around watching TV news clips of the carnage that they had initiated. A lot of screen time was devoted to the two brothers and their emotional interaction with each other, and their victim Dun Meng (Jimmy O. Yang). The most tense and chilling scene was the carjacking, where some of the fury was revealed, not for ideology but simply because the younger Tsarnaev kid did not get to drive the Meng’s Mercedes! 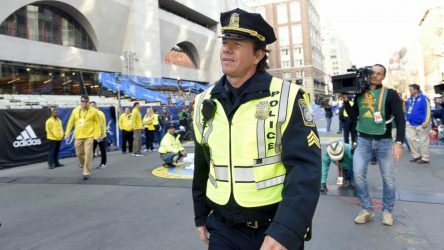 This is where Patriots Day excelled, in portraying terrorists as more than just robots who strapped explosives to their bodies or fly planes into buildings. Dzhokhar was just an immature college kid that appeared to be more loyal to his brother than to any jihadist cause. Patriots Day was a good movie, and movies that are restrained by the facts of actual events are always tougher to pull off. Patriots Day did have its faults, as it seemed overly long and tried to do too much within that 2 hr 13 minute run time. My main objection is that it spent a lot of time trying to develop and include individual victim’s stories. The ending, which included clips of the actual victims just seemed unnecessary and forced, as I’m not a fan of movies tacking on stuff after the credits roll. 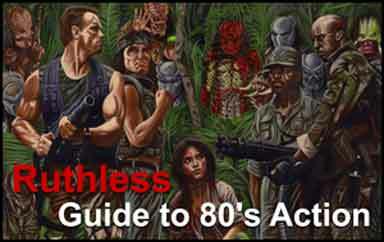 These were just minor flaws, if flaws at all, and didn’t really detract from this fine movie. In spite of the couple of negatives, Patriots Day was an exciting and informative film that had to deal with a difficult subject matter. The carjacking scene that led to the ultimate explosive shoot-out in Watertown was an intense interaction between the good guys v. the bad. The investigative process in the warehouse with cooperative, yet sometimes divisive factions of law enforcement and politicians was tense, as everyone desperately wanted these terrorists captured before they could strike again. 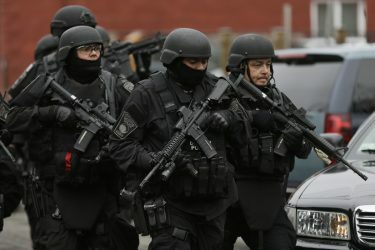 What the film demonstrated most of all was the spirit of cooperation of the Boston police and officials’ and the fierce resiliency of the residents of this wounded city.